Vibrant hues and patterns evocative of 1970’s Americana are the hallmarks of Denyse Schmidt’s newest collection for FreeSpirit Fabrics. Chicopee is inspired by Denyse’s school years in central Massachusetts and prodigious amounts of television. Favorite shows – which influenced her formative fashion sense – include The Brady Bunch, Mary Tyler Moore, The Partridge Family, and re-runs of The Monkees. Chicopee will have you longing for back-to-school sewing, Levi’s cords, Earth shoes and that cute senior in his paisley shirt. A bright and warm palette of Push-Pop orange and raspberry with Relish green and turquoise is both of-the-moment and nostalgic. 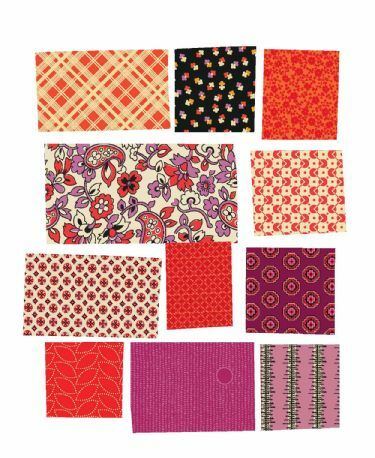 Ideal for apparel, Chicopee’s prints and hues are designed to support quilt projects in Denyse's new book, Modern Quilts, Traditional Inspiration: 20 New Designs with Historic Roots (STC Craft, April 2012). Order the Flowering Vines quilt pattern featuring Chicopee!